In our second Christmas SEO recipe, we explain how you can achieve perfect image optimization to help improve your website’s performance and rankings. Christmas without a proper Christmas stollen just wouldn’t be as good. The same applies to image optimization without alt tags or image compression. 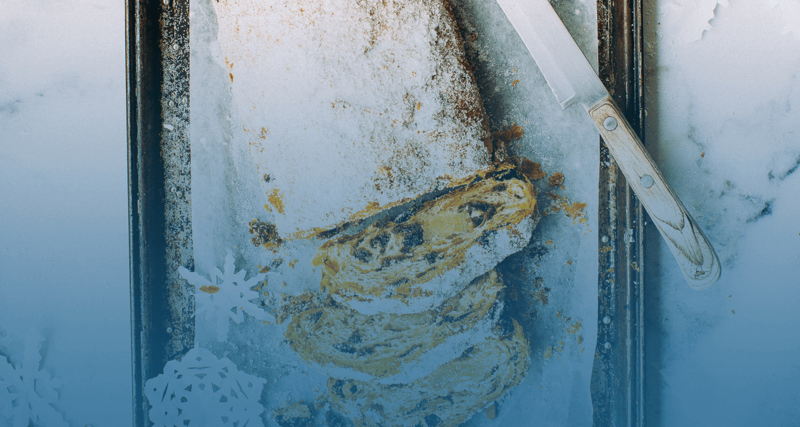 We’ve prepared a particularly special Christmas stollen recipe to help you optimize your images perfectly – the Ryte Image Stollen with ALT-tags. Labelling your images with alt and title attributes in the source code will ensure that search engine crawlers can read your images, and that visitors to your website receive information about your images when there are technical problems. Images that aren’t optimized properly can also cause problems with page speed. 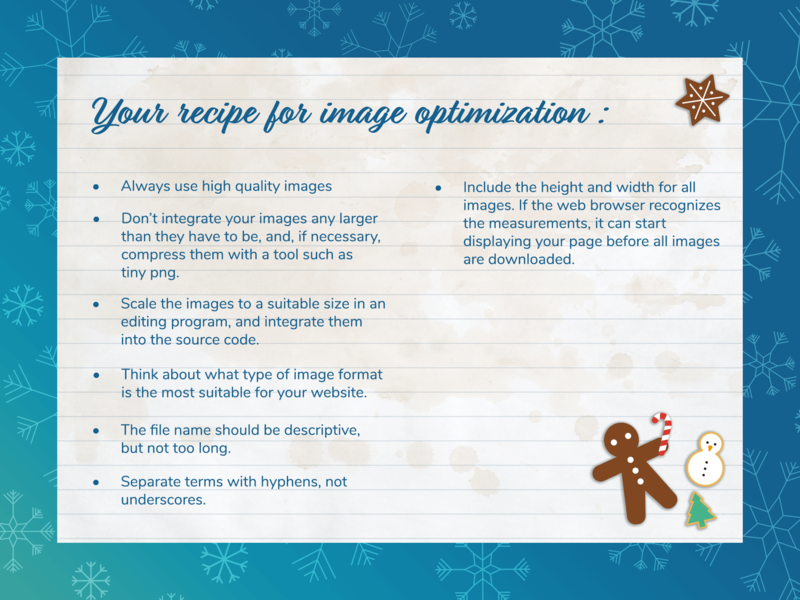 Optimize your images with our easy recipe, and you’ll be able to relax and enjoy your Christmas treats knowing that the hungry search engine crawlers are feasting on your delicious image stollen, improving your website’s performance and rankings. 1. Lightly grease your baking tin. There are many different sizes and shapes, so be sure to choose the right one for your image stollen. The most commonly used types are PNG, JPEG and GIF. 2. Weigh up 120g of title-tags flour – make sure you use the right keywords and right type of flour, as not all types are suitable for image stollen. 3. Stir in 10 keywords and 10 ALT tags – this is how search engines can read your images, and this is what will show on the page if the image cannot be displayed. Make sure you don’t stuff the mixture with keywords – it should stay light and airy. 4. Whisk in the image compression. Large images can slow down the page speed, causing your stollen to flop. There are many available tools for image compression, such as Adobe Photoshop. 5. Let the dough rest for half an hour, then knead in the zest from a Google Search Console to ensure that your image stollen can be found by the hungry search engine crawlers. 6. Place your image stollen in the oven, and bake for 30 minutes on 180 degrees. Once your image stollen is ready, have a taste! Ryte’s module Website Success will help you check whether you’ve used the right ingredients. You can use the ALT tag report in Website Success for an overview of your images and their ALT tags. Click on the menu point “Assets”, “Images”, “Alt Values”, and you’ll see a list of all images with their ALT attributes. 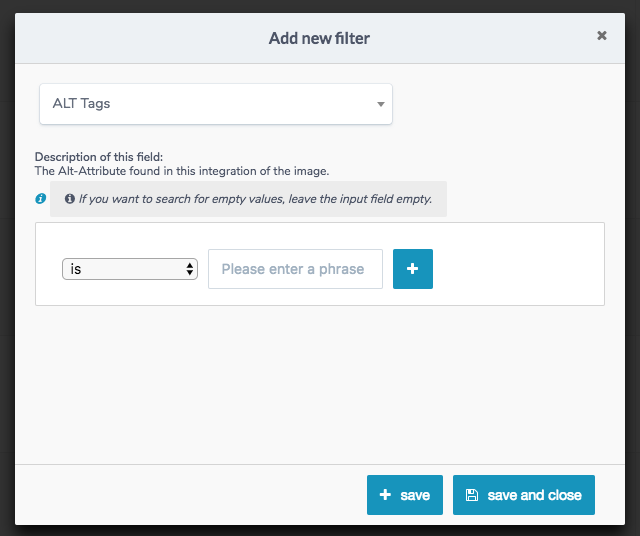 To find the images on your website that don’t contain ALT tags, set a filter for “Alt tags” and leave the input field empty, as illustrated in Figure 3. You will then see which images you may need to add ALT tags to, and you can subsequently optimize these images in your CMS. Published on 12/07/2017 by Olivia Willson.